This is one of the most unique and cool bath rugs in our collection. 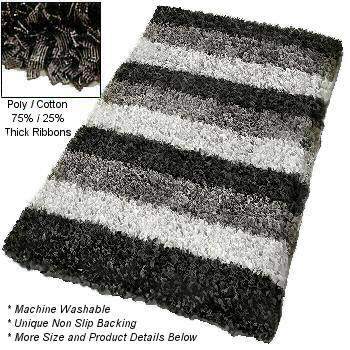 A modern shag rug which will add texture and a wow factor to any bathroom. Unique polyester and cotton blend woven into thick ribbons which creates a .94in tall shag pile giving this design a unique contemporary look. Slate Grey: The densely woven thick ribbons range in color from a very dark slate grey almost black to pewter and silver grey. Taupe: The thick ribbons range from a shimmering taupe to a cashmere to a light beige. Really quite stunning. 75% polyester / 25% cotton blend woven into thick ribbons.